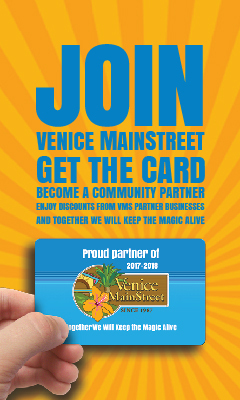 Come and Experience the first inaugural Venice Seafood & Music Festival, hosted by Venice MainStreet. Locals and visitors will be raving about this event until we do it again next year! Prize-winning seafood dishes will be served up at Centennial Park on Saturday and Sunday, May 6 and 7, from 11am to 8pm each day. Admission is free. All of you seafood aficionados are invited to savor your local favorites from Blu Island Bistro, Brew Burgers, Burgundy Square Café, Café Venice, Captain Eddie’s, Cedar Reef, Crow’s Nest, Daiquiri Deck, Made in Italy, and Saltwater Café. The Venice Seafood & Music Festival will offer a full menu of delectable delights. Ready, set, sample a little bit of everything — chock-full chowder, fresh-shucked oysters, tender Group Cheeks, Ahi Tuna and many more tasty surprises. Local restaurants and seafood purveyors will prepare their mouth-watering creations on-site from fresh ingredients sourced locally from Florida’s coast waters. Meat and vegetarian dishes will also be available, as well as both alcoholic and non-alcoholic beverages. And while you are dining with friends and family, tune your ears to the captivating sounds of live musical performances on stage by some of Florida’s and the region’s top musical talents. Whether you are on your first appetizer or your last bite, enjoy the variety of musical genres filling the airwaves, from R&B, jazz, rock, reggae, and soul to hip-swaying Caribbean sounds. Saturday’s band line-up will feature Ocean’s Eleven Big Band, Spark Notes, Sarasota Steel Pan Band, Jah Movement followed by Sarasota Jazz Project, Kettle of Fish, Mac Arnold & Plate Full O’Blues, and Twinkle & Rock Soul Radio on Sunday. We thank you in advance for your generosity as volunteers from the South County Food Pantry will be collecting non-perishable food items on both days of the Seafood Festival at the Centennial Park Kiosk from 11am to 6pm. Join us for a weekend of delicious food and drinks and music while enjoying the camaraderie of family and friends and beauty that is downtown Venice. We will lay the feast – all we need is you! Visit www.seafoodfestivals.com for additional information including menus and the band performance schedule.